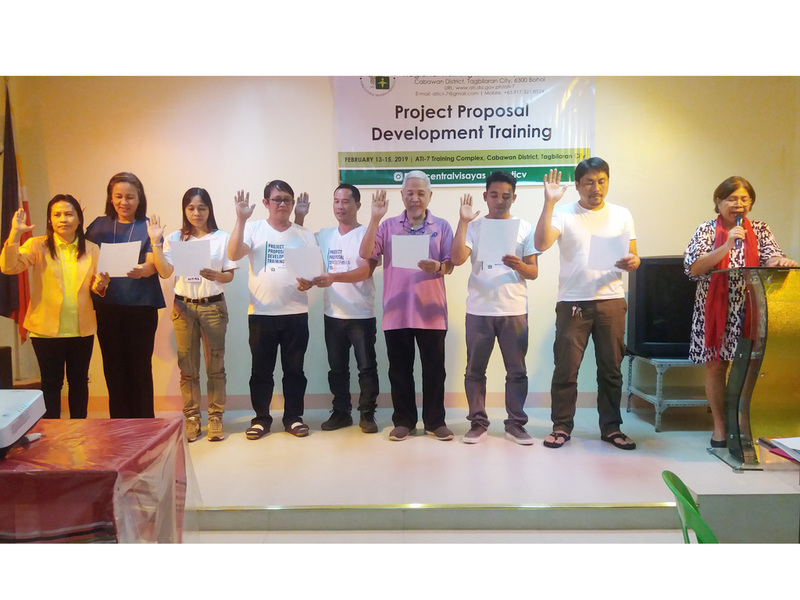 TAGBILARAN CITY – Majority of the Learning Site Cooperators in the region which represented the four-islands of Bohol, Cebu, Negros Oriental, and Cebu attended the three-day Training on Project Proposal Development last February 13-15, 2019 at ATI-7 Training Complex, Cabawan District, this city. Due to the timing that these cooperators are convened and were able to share their farm activities and experiences, they suggested to the Agricultural Training Institute-7 to organize themselves to build the network and strong linkages among themselves where they can easily update and share technologies and innovations. The name of the organization is yet to be conceptualized by the officers. Dr. Carolyn May O. Daquio, ATI-7 Center Director is amenable with the suggestion; thus, the election and oath-taking took place in the afternoon of the last day of the training. Thus, the following were the elected Learning Site Cooperators in Region 7: Reyland P. Jabonillo of Maribojoc Binhi sa Panginabuhian Demo Farm is the President while four Vice-Presidents were elected representing the four provinces: in Siquijor, Elnard S. Ympal of Elnard Integrated Farm; in Cebu is Cristino L. Villamor, Jr. of Saint Peter Academy of Alegria Foundation, Inc. (SPAAFI) Demo Farm; in Bohol is Nilo S. Cempron of Gulayan sa Paaralan, Eastern Cogon Elementary School and in Negros Oriental is Dr. Jose R. Medina of Inday Pita Farm. The secretary is Niema O. Toroy of Egay’s Farm while Maria Norisa A. Kho of Charis Wellness Garden Integrated Diversified Organic Farm is the treasurer and Clavel P. Aves of First Consolidated Cooperative along Tanyon Seabords is the Auditor. Dr. Carolyn May O. Daquio administered their oath of office.